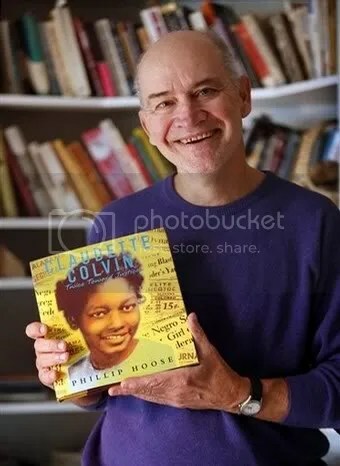 Phillip Hoose is a nonfiction author of eight books for children and adults. He lived in Indiana, has a degree in Forestry and Environmental Science from Yale, is a founding member of the Children’s Music Network, and now lives in Portland, Maine. He just got married and bought a house with a view of the Atlantic. He is also National Book Award nominee for 2009- his second time being honored. Mr. Hoose spoke to my class yesterday, after we’d read all of his books, and it was really great to chat with him about his books, about writing, and about what it’s like to be a career writer in such a rapidly changing world. His editor also joined our conversation. Although a sensational story might seem like an easy path toward a successful book, topics such as racial injustice and other “finger-pointing” stories are shyed away from in the publishing world. This was the case with his book Necessities, which was a commercial failure, but an AWESOME, saddening book about racial issues in sports. Mr. Hoose chooses his books based on the story he can tell – it has to be personally compelling, important to children, and fairly untold. 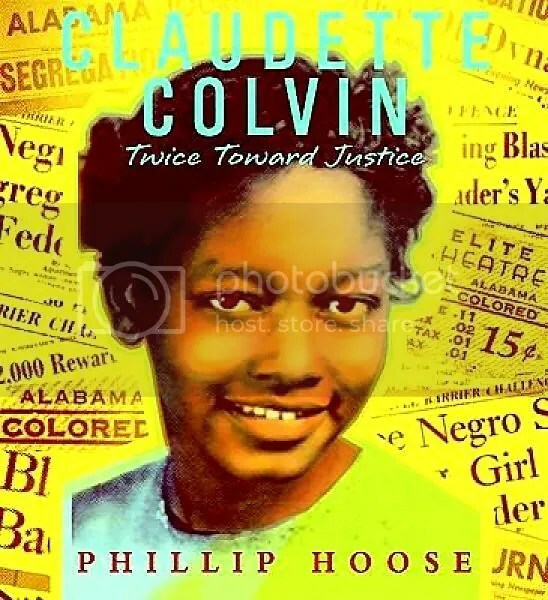 For his latest title, he learned about Claudette Colvin and was immediately interested in her story – she was a teenager when she refused to give up her seat on a Montgomery bus, was sent to jail, and later testified in the seminal Supreme Court case, Browder vs. Gayle. But she’s not a hero. In fact, nobody had heard of her. According to history, Rosa Parks refused to give up her seat, not Claudette Colvin. Hoose was interested in the woman’s bravery as a teenager and how her story was lost over the years, from her point of view. His writing process starts a little like this: What is my thesis and what kind of stories and format can sell this thesis? His first book, Hoosiers, started off dry and journalistic, but when he decided to tell his story in stories, anecdotes, and narratives instead of essays, he managed to convince even some of our sports-hating classmates that yes, Indiana basketball is crazy and amazing. He emphasized writing about topics you are passionate about, but from our discussion, I interpreted this comment a little differently than you might think. I don’t think you – or Mr. Hoose – should write only about things you love in your life. I don’t need to write a book about baking or reading or Arrested Development or whatever. It seems that Mr. Hoose chose a topic that touched his life in some way, and sometimes the research inspired the passion. Or sometimes, the passion lies in the book’s larger implications in the world – he admitted that We Were There, Too! was a very difficult book to write but he was passionate about providing a historical narrative for young people in society, which is why he wrote it. You can be passionate about a person’s story, passionate about conservation, or just passionate about opening discourse on a certain topic. Yes, you need passion, but it need not be something you are ALREADY passionate about. It’s hard to get ahead writing nonfiction for children. All of chidren’s literature is very award-driven. If only 10 or so books can be awarded any large honor in a year, hundreds of other books then go under the radar. And nonfiction is even worse. At the National Book Award ceremony in 2001, Hoose said he met his nominators and they acted as if nominating his book was a very bold move on their part. His reaction? It was a great book, whether or not they were ‘bold’ enough to nominate it, and why didn’t it stand a chance of winning. His most commercially successful book is his only picture book, Hey, Little Ant!. He wrote it in an hour with his nine-year-old daughter, Hannah, and it has sold over a million copies. Mr. Hoose is remarkably grounded and humble for his recent success, but not afraid to challenge the book-world, discussing how it sometimes fails many authors. He is anti-Kindle. He is a mix of creative and business-saavy that is probably a marker of a successful author. Even though we imagine authors as dreamy and devoted, offering pithy sentiments about stories and characters and blah-blah-blah. He wasn’t like that at all. He didn’t have answers to some of our questions, because he’s too busy writing and researching to sit around and analyze his own work. It’s Our World, Too is a collection of true-life child activists, both from history and today. 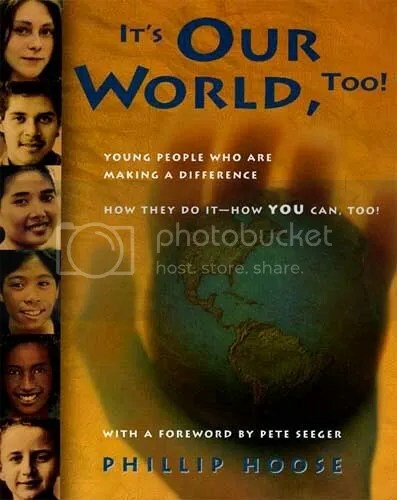 It also includes a handbook for how young people can start a revolution social change themselves. We Were There, Too! 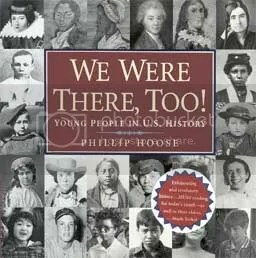 is almost an alternative history text, covering Christopher Columbus all the way to the present, featuring so many interesting stories about kids. It was spurred by a girl telling Hoose that she felt like she wouldn’t even be a person until she turned 20, or so, because anything she did would never be in a history book. This is almost a reference text, and would be a great gift for a brainy elementary schooler who is a budding history buff – or just one you’d like to persuade into becoming a history buff. This was a National Book Award nominee and featured a blurb from Studs Terkel. 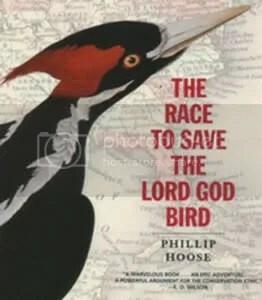 The Race to Save the Lord God Bird is a book about extinction – in particular, the extinction of the Ivory-Billed Woodpecker. The book follows the bird’s history back to our nation’s start, and slowly unfolds the various ways that humans revered and abused the bird to its probable extinction. Really good book, even for those not interested in birds or conservation. A Boston Globe – Horn Book Award winner. Phillip Hoose is the cousin, once removed, of Don Larsen, who pitched a perfect game in the 1956 World Series. 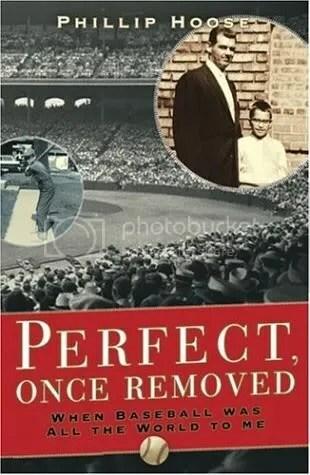 Perfect, Once Removed is Hoose’s memoir of his childhood as a baseball addict who was crappy at baseball, an admirer of his distant cousin, and growing up in suburban Indianapolis. Think A Christmas Story, with the humor but not bawdy humor, and if the movie was called A Baseball Story. Claudette Colvin: Twice Toward Justice is a biography of an unsung civil rights hero – a teenage girl who was thrown in jail for refusing to give up her bus seat, but who fell out of history books all together. Although civil rights books have been done and done again, this book gives a fresh perspective by including actual commentary by Colvin herself, presenting her teenage-girl perspective, and really showing both sides of Jim Crow in a way that gives the civil rights leaders a respect I never saw, even reading more seminal texts on the historical period. A National Book Award Nominee for 2009. This is awesome. I’m reading Claudette Colvin right now and really enjoying it so far. Great post and what a cool opportunity. Jessica, Phil cannot stop talking about what a grand time he had in your class. Since his visit, I have put together a YouTube of his appearances with Claudette Colvin over the few months. In Claudette today you can see the spark on the 15-year-old that stood alone against segregation. Thought you (and your classmates) might enjoy seeing it.